← 40th Anniversary Year Starts Now! 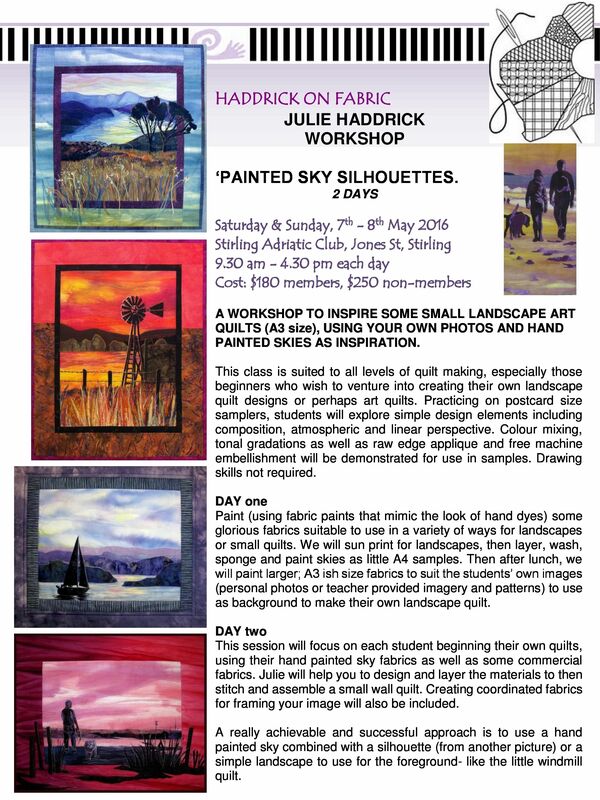 This year we have invited well known South Australian Quilter and teacher Julie Haddrick to visit, present workshops and share the judging role at Quiltwest. Julie is a now retired art teacher and much of her work has the look of an art work. She has entered many exhibitions and won significant prizes for her art quilts both in Australia and overseas, was known for amazing stained glass and botanical quilts and now is offering to us skills and techniques that will assist you to make stunning painted and appliqued landscapes and also with drawing and designing elements for your own quilts and /or textiles. Julie will be talking to members at our General Meeting in May, as well as presenting 3 days of workshops. 4th May will be the General Meeting at which Julie will talk to us and show some of her work. This is an opportunity to see her wonderful artistic creations and hear about her journey. A must see event! No charge. Supper provided. Please bring your mug. Go to the workshop page to download the workshop flyers, application forms and class requirements. Please note: people who have expressed an interest will be given priority. When: Saturday and Sunday 7th and 8th May. 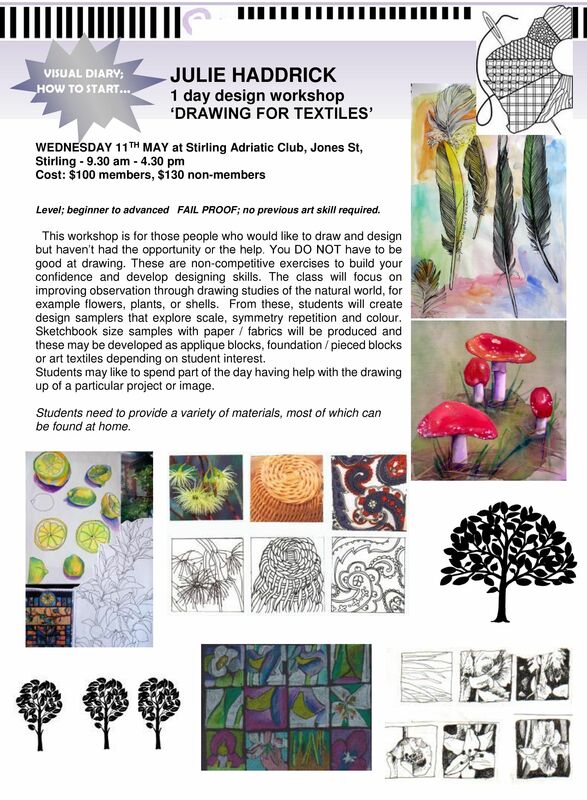 One day workshop: Drawing for Textiles. For further information, please call Kerry on 0437013396 or research Julie at haddrickonfabric.com.au and see her gallery of delightful quilts and textile art. These workshops sound like excellent adventures.